For the month of July, we will be shipping free t-shirts to certain subscribers to our blog and Facebook pages and holding a contest. To begin, go to Seagate’s Facebook page on or after July 4th. 2. July Contest: To be eligible for $50 (1st prize), $25 (2nd prize) or $10 ( five 3rd prizes) in Seagate store credits, share as many of our Facebook posts that appear during July as you are able. 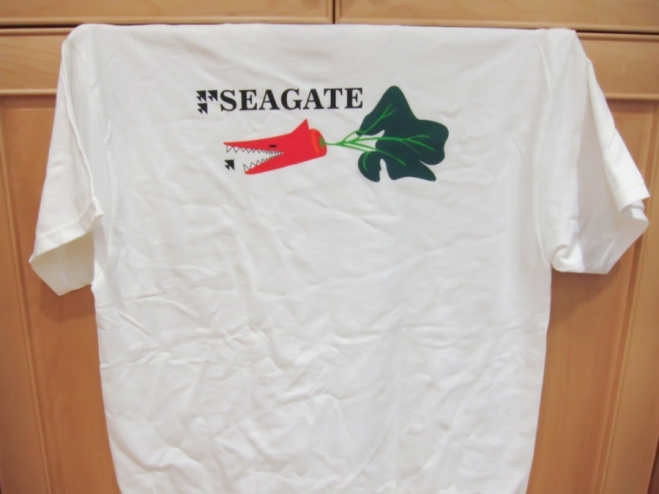 Typically every 3 days we put up a new SeagateWorld blog post that is connected to our Facebook page. The person who has answered the oil question above correctly and has shared the greatest number of our July Facebook posts during the month of July will win a first prize of $50 in credits towards their next Seagate order. The person with the 2nd most shares (and has answered the question correctly) during July will win $25 in credits. The 5 people with the 3rd most shares (and have answered the question correctly) during July will win $10 in credits. Winners will be announced by August 10th after we have added up all the shares. The contest and t-shirt offer ends 7-30-16.
michael GRISSOM - Olive oil, coconut oil, vitamin E oil , omega 3 fish liver oil is in the bye-bye burn, PRICELESS. Richard (Founder) - Thank you for participating in the t-shirt contest. An email has been sent to you requesting your size.